Okay guys I am not a globe person but like this one because it seems to be authentic. 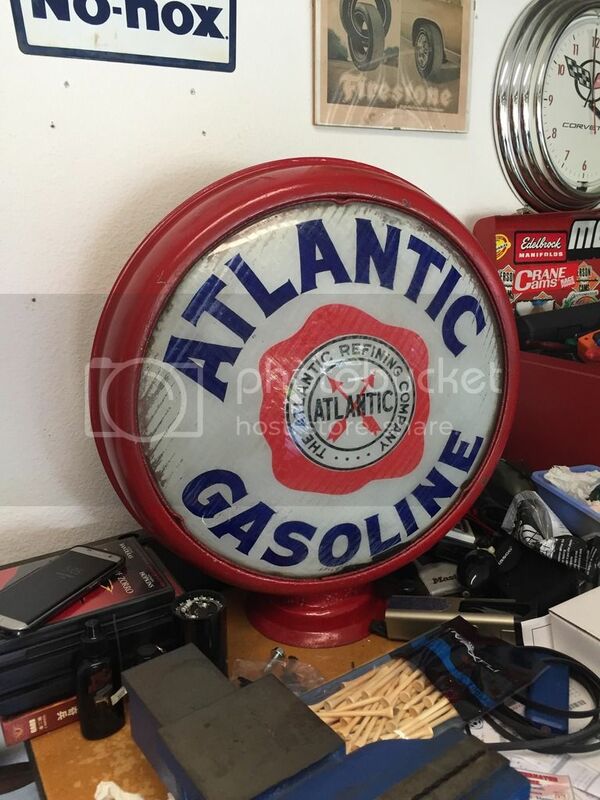 It is far from perfect but better then the only other one I have seen where the red had washed out in the central logo, The glass insert is large and measures approximately 16 and 1/2 inches in diameter with a snap ring holding it in place. The glass is gone from the back. The globe glass has what appears to be residual cardboard on the inside from its storage days. The can is metal and measures approximately 7 inches across the base. I have searched and only seen a couple of similar ones but may not be looking in the right place for value. Any idea of age and value plus or minus. THANKS! Last edited by 68air; Sat Sep 08 2018 09:35 PM. okay over 60 views--anyone globe people out there? I'm not a globe person either, but I bought the gasoline globe book, and it lists 2 types of 16.5" lenses. One is a milk glass cast lens (1920-1922) but it looks more red in the center than yours. The other looks just like yours and is dated from 1920-1934, rarity of 3, and valued at 800-1250, but that value is for a complete globe, not a single lens. hope this helps ya.